High agricultural land prices have fueled double digit year-to-year increases in the county’s valuation five out of the past six years, but this year’s increase is by far the largest. 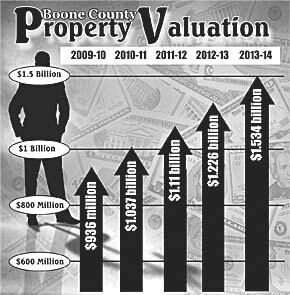 The county’s total property valuation for the 2013-14 fiscal year is $1,533,513,853, which represents an increase of $306,683,284 from last year’s total of $1,226,830,569. Details in the Aug. 21 Albion News and Petersburg Press Print & Electronic Editions.